We joined Bryan and Kerry for dinner before the Jason Isbell show in Freeport at the Harraseeket Inn where they were staying. The website describes the restaurant as serving "refined, contemporary New England fare with a savory dash of French flamboyance, focusing on the local, seasonal, and organic bounty of Maine." Kerry and Bryan started the meal with raw oysters ($3, each); they were fresh and briny served with a mignonette. I had the scallops for dinner (7 Ounces of Local Maine scallops, Creamy Roasted Corn, Potato Crackle and Grilled Tomato, $28) and they were excellent. 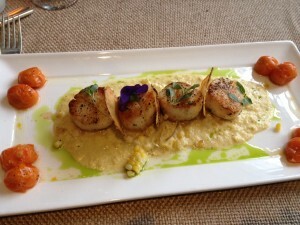 The scallops were cooked perfectly and I loved the roasted corn accompaniment. "Potato crackle" is a new term for potato chips, FYI. Steve had the duck breast (8 Ounce Skin-On Breast, Raspberries, Potato Pave, Summer Beans and Raspberry Gastrique, $25) I had a bite and the duck was cooked correctly and I liked the sweet/tart aspect of the raspberries. 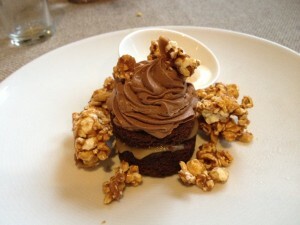 We shared two desserts: a chocolate cake with chocolate mousse filling and caramel corn garnish and a Blueberry Cheesecake. The chocolate cake was super dry (I feel like you can even see the dryness in the picture. 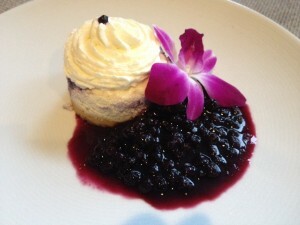 The blueberry cheesecake was better; the texture was appropriately creamy.